May 2016 saw an exciting re-ignited interest in the Pawn World. Jerry Whitehead of Pawnshop Consulting Group in Conjunction with the Florida Pawnbrokers Association hosted the first of its kind Crossover Expo in Orlando Florida. Co-Owner of GCPAWN Josh Davis serves as the President of the Florida Pawnbrokers Association (FPA) and his brother and partner Adam Davis serves on the Board of Directors. The Crossover Expo was designed to bring pawnbrokers, payday lenders, check cashiers, and others together to learn about their industries, network and meet with 40+ vendors that also attended. Josh was accompanied by FPA lobbyist David Sigerson and Bill Helmich. 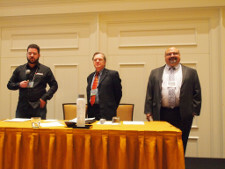 Josh discussed the state of the industry in Florida while David and Bill spoke about the legal issues facing the industry and how important it is to be involved at the state level and support the industry as a whole.